I recently bought a Mini Dollfie Dream of the marketplace on Den of Angels and she arrived yesterday. I opened her up to check that everything was ok and then she immediately went into dolly surgery ^__~” She came with some minor staining on her legs – nothing too bad, but a bit of a nuisance. Since I was planning on removing the vinyl calves off of her plastic skeleton I took the time to install kips into her knees since I’ve heard that MDD knee joints are weak, sometimes loose and the dolls can’t stand on their own very well. I did take photos of this process so I’ll do a mini tutorial at some point but it was very simple. Kips are little silicone discs that are usually used in the joints of resin BJD’s to add friction and improve posing. Just handling her, her body is more “floppy” than my large Dollfie Dreams but her arms have a better range of posability. Also, she was sent to me with blank HDD-01 head so I’m going to take her over to Machiko’s later this week so that she can give my new doll a faceup. I had Kev cut notches into her headcap so that it’s easier to remove and put back on since the original DD vinyl is very stiff – not like the new squishy heads that Airy and Moe v.2 have. I had a pair of stray 20mm animetic eyes laying about so I put them in, and they suit her. I think I’ll call her Médée (pronoucned “meh-DAY”) – a cute little name for a cute little girl. Here’s a quick photo of her hanging around with Bubba – she’s about the same height as him! ^__^” I’ll do a formal welcoming for her when she’s done with all her surgical procedures. This entry was posted in Dollfie Dream by archangeli. Bookmark the permalink. LOL – she is so small. 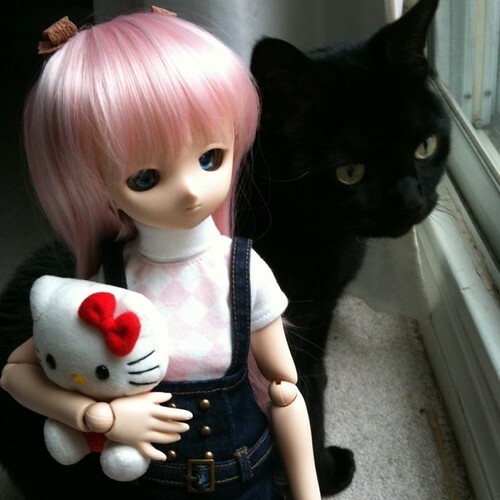 I wish I’d taken a photo of her with my sister’s yo-sd sized dolls though – those are super sweet and small! Is it the new mdd body?